Tired Of Getting Little Or No Results From Your Article Submissions? Are you struggling to make a few bucks a day from your online business? "Discover An Easy Way To Turn Your Writing Into Cash And Drive Massive Traffic To Your Website With This Step-By-Step Guide"
Article Marketing Is Spreading Across The Net Like Wildfire Now It's Your Turn To Grab Your Piece Of The Profit Pie! 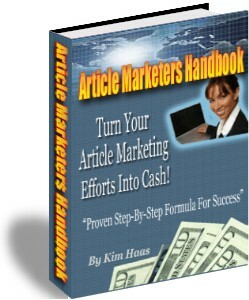 The Article Marketers Handbook Will Show You The Secrets To Making Your Website Pay! Massively Increase Your Website Traffic For Free! Become An Expert In Your Market! Never Pay A Dime For Internet Advertising Again! How to create articles that people love, even if you don't write them! The 10 minute a day article marketing success secret! How to be the #1 expert in your market without writing loads of content! Secret ways to grab articles without writing them that you can put your name on! How to generate more traffic than you could possibly imagine without spending a dime! How to guarantee that your articles get widely published effortlessly! This PDF handbook normally sells for $37.00 but it can be yours for just $1.00!